Preprints (earlier versions) of this paper are available at http://preprints.jmir.org/preprint/9031, first published Oct 15, 2017. Background: Wireless electronic adherence monitors can detect antiretroviral therapy (ART) adherence lapses and trigger interventions in real time, thus potentially avoiding unnecessary HIV viremia. Evidence about the acceptability and feasibility of these monitors and associated interventions, however, is limited. Objective: The aim of this study was to assess the acceptability and feasibility of real-time adherence monitoring linked to text messaging (short message service, SMS) reminders and notifications to support adherence among individuals living with HIV who are taking ART in rural southwestern Uganda. Methods: Individuals living with HIV who were initiating ART were enrolled in a pilot randomized controlled trial and followed up for 9 months. Participants received a real-time adherence monitor and were randomized to one of the following study arms: (1) scheduled SMS, (2) SMS triggered by missed or delayed doses, or (3) no SMS. SMS notifications were also sent to 45 patient-identified social supporters for sustained adherence lapses in the scheduled SMS and triggered SMS arms. Study participants and social supporters participated in qualitative semistructured in-depth interviews on acceptability and feasibility of this technology. An inductive, content analytic approach, framed by the unified theory of acceptance and use of technology model, was used to analyze qualitative data. Quantitative feasibility data, including device functionality and SMS tracking data, were recorded based upon device metrics collected electronically and summarized descriptively. Results: A total of 63 participants participated in the study. Participants reported that real-time monitoring intervention linked to SMS reminders and notifications are generally acceptable; the predominant feedback was perceived utility—the intervention was beneficial in motivating and reminding patients to take medication, as well as enabling provision of social support. The intervention was found to be technically feasible, as data were obtained from most participants as expected most of the time. Potential challenges included the impact of the technology on confidentiality, shared phone ownership, usability skills, and availability of electricity. Conclusions: Real-time adherence monitoring integrated with SMS reminders and social support notifications is a generally acceptable (based primarily on perceived utility) and feasible intervention in a resource-limited country. Future efforts should focus on optimized device design, user training to overcome the challenges we encountered, cost effectiveness studies, as well as studying the monitoring aspect of the device without accompanying interventions. HIV or AIDS remains one of the biggest public health challenges, especially in developing countries, which accounts for over 70% of the 36.9 million people living with HIV or AIDS (PLWHA) globally. Antiretroviral therapy (ART) adherence is critical for achieving viral suppression, which leads to improved clinical outcomes and reduced secondary transmission. Despite simplification of HIV treatment (eg, single tablet and once daily dosing regimens) and improved access to ART, adherence remains challenging . Nonadherence can result in HIV viremia, ART failure, and drug resistance, which can lead to deaths because of limited or complete inaccessibility of alternative therapies in resource-limited countries. Traditional approaches to adherence monitoring (eg, self-report, pill counts, and pharmacy refills) do not enable real-time interventions, as they may not detect nonadherence until viral suppression has been lost . mHealth technologies can potentially improve adherence to long-term medications through real-time medication and pill refill reminders, prompting social support and enabling medication monitoring . Real-time wireless adherence monitors, for example, can detect adherence lapses as they occur, and interventions such as SMS reminders can be instituted before the loss of viral suppression . Widespread cell phone ownership and mobile network coverage in sub-Saharan Africa provide a promising platform for the implementation of mobile-based interventions, which can help overcome structural barriers such as transportation to a clinic and limited human resources and enable frequent intervention when and where it is needed [5,6]. SMS reminders unlinked to real-time adherence monitoring have been shown to improve adherence to ART in resource-limited settings [7-9]. The use of these SMS reminders has been reported as acceptable in Uganda , Kenya , South Africa [9,10], India  Brazil , and the United States . Data, however, have been more mixed in China [2,14]. Weekly and twice-weekly SMS text message (short message service, SMS) reminders have been reported to increase adherence in Kenya and Nigeria [8,15]; however, no benefit was seen with daily SMS text messages in another study in Kenya . SMS reminders triggered by lapses in real-time adherence monitors have been shown to improve adherence and reduce lapses in adherence in several but not all settings [2,11,12,17-20]. Compared with standard electronic monitoring, real-time electronic adherence monitoring (using Medication Event Monitoring System—MEMS) plus home visits for sustained interruptions increased average adherence in Uganda . The acceptability and feasibility of SMS reminders in Uganda, however, have not been well studied. SMS reminders triggered by late or missed doses detected by real-time adherence monitors improved overall antiretroviral adherence in China  but did not significantly improve adherence in South Africa, although it had fewer sustained adherence lapses . Given the promise of real-time adherence monitoring and mobile-based interventions, the variability in effectiveness, and scarcity of literature, more thorough assessments of their acceptability and feasibility are needed. We conducted a pilot randomized controlled trial (RCT) based on real-time intervention linked to SMS reminders and notifications to support adherence among PLWHA taking ART in rural southwestern Uganda. As previously published  (Trial ID number: NCT01957865), adherence significantly improved for participants receiving scheduled SMS reminders that were sent daily and then weekly. Moreover, participants reported that the intervention encouraged medication adherence through feeling cared about, habit formation, and a desire to show commitment to taking their medication . Within the context of this pilot RCT, we used both qualitative and quantitative methods to assess the acceptability and feasibility of the intervention (a package of real-time adherence monitoring, SMS reminders for patients, and SMS notifications for social supporters). Ethical approvals for this study were obtained from the Institutional Review Committee of Mbarara University of Science and Technology, the Uganda National Council for Science and Technology, and the Partners Human Research Committee at Massachusetts General Hospital. Participants provided signed informed consent before study participation. All participants’ data were securely stored electronically and protected by passwords. As a cultural practice in Uganda, participants were given 10,000 Ugandan Shillings (per trip; equivalent of approximately US $4) to cover transportation costs if they came to the research offices for an interview). This study involved two types of participants: PLWHA (called study participants) and their social supporters. Study participants initiating ART were recruited from the Immune Suppression Syndrome Clinic at Mbarara Regional Referral Hospital (MRRH), a rural public hospital that dispenses free ART to over 10,000 people living with HIV in southwestern Uganda. We focused on ART initiators because they are not yet accustomed to taking medication; intervening at this level could potentially result in developing medication adherence habits. HIV status was identified by checking participants’ medical records Recruitment criteria for study participants are shown in Textbox 1. Each study participant named one to two social supporters who met the following criteria, as shown in Textbox 2. Scheduled SMS (also known as SMS reminders) plus real-time adherence monitoring (scheduled SMS arm)—Study participants received an SMS reminder daily for 1 month, then weekly for 2 months. For the next 6 months, study participants received an SMS only if no signal was received from the monitor within 2 hours of the expected dosing time, and an SMS notification was sent to one to two social supporters if no signal was received for more than 48 hours. Triggered SMS (also known as SMS reminders) plus real-time adherence monitoring (triggered SMS arm)—For the entire 9-month study period, study participants received an SMS only if no signal was received from the monitor within 2 hours of the expected dosing time. For the latter 6 of the 9 months, an SMS notification was sent to one to two social supporters if no signal was received for >48 hours. Real-time adherence monitoring only (called the control)—Study participants in this arm received no SMS reminders. Literature about the appropriate frequency of SMS texts is mixed up. For example, weekly SMS reminders increased adherence in Kenya , whereas no benefit was observed in Cameroon . We therefore used different types of SMS texts as we sought to test SMS communication to patients and social supporters sequentially to efficiently study which ones were most feasible, acceptable, and impactful. For instance, our findings published elsewhere indicate that unlike SMS linked to late or missed doses, scheduled SMS significantly increased adherence  and were preferred to linked SMS texts . Social supporters were identified by study participants at enrollment. Social supporters were enrolled into the study at month 3 and were contacted during week 2 before sending them SMS notifications to ensure ongoing relationships with study participants when the SMS notifications began. They were sent SMS notifications during months 4 and 9 after potential lapses in adherence of study participants had been identified. Social supporters were not given specific instructions on the kind of support to be provided but were generally encouraged to support study participants. Textbox 1. Recruitment criteria for study participants. Textbox 2. Inclusion criteria for social supporters. Dimagi (a mobile technology solutions company, Cambridge, Massachusetts, United States) and Yo! Voice Solutions (a gateway service provider, Kampala, Uganda) developed the SMS reminder system that was hosted in the open source application, CommCare. This application was then linked to the real-time adherence monitoring system. Powered by a rechargeable battery, the real-time adherence monitor (Figure 1) is a medication container that can hold up to sixty small pills. 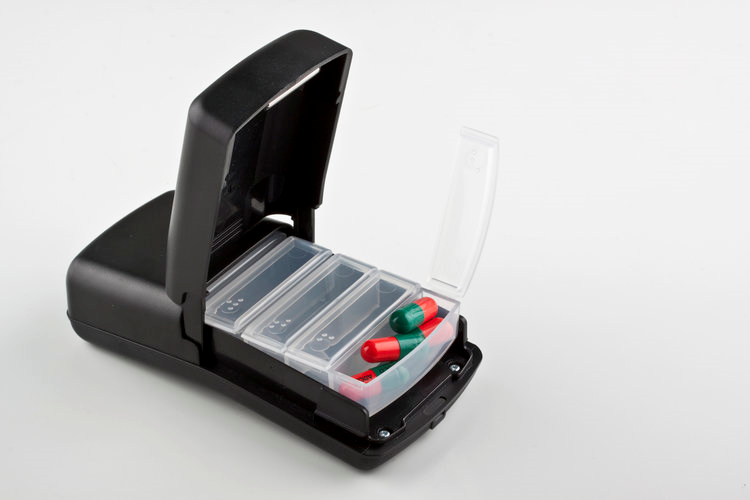 When an individual opens it to take pills, the device records a date-and-time stamp. An internal modem and subscriber identity module card enable the device to send a real-time mobile signal to a secure Web server (hosted in South Africa) by General Packet Radio Service (GPRS). Receipt of this signal was taken as a proxy for taking medication. GPRS maintains the data in transit until acknowledgment of receipt by the Web server, which minimizes possible data loss because of power failure or lack of Internet connectivity. Data transmission is backed up by the SMS to mitigate possible temporal GPRS network disconnections. In the event of inadequate mobile network coverage, the monitor stores openings in flash memory and sends them when the network becomes available. The monitor also transmits a daily heart beat that indicates current battery life, remaining airtime balance, and signal strength as indication of its functionality. The monitor can be charged using electricity or a solar device. Its battery life was 3 months at the time of the study but has since been improved to 6 months. Study participants were seen at baseline, 3 months, and 9 months for collection of socio-behavioral data and viral load assessment. Signals sent after opening the real-time adherence monitor to the study server comprised the adherence data. Semistructured qualitative interviews were conducted after month 3 (known as interview 1) and after the first 48-hour lapse (known as interview 2), or at study exit if there was no such lapse (also known as interview 2), reflecting two planned interviews per participant. In-depth semistructured interviews with a purposeful sample of social supporters were conducted within 2 weeks of a lapse by their respective study participant. Their selection was based on the study participant’s explanation for the lapse, social support characteristics, and variations in the types of social support provided. Closed and open-ended questions were asked of social supporters at exit exploring various aspects such as challenges and experiences to social support and understanding of and responses to the intervention SMS notifications and the type of voluntary and requested help or support presently given to the study participant toward adherence. Figure 1. The Wisepill device. Research assistants who were bilingual in English and the local language (Runyankole) and trained in qualitative research and research ethics carried out semistructured in-depth interviews at the research office, participants’ homes, or any other place preferred by the participants. Interview topics with study participants covered the following: (1) preferences for content; frequency and timing of SMS reminders, (2) understandings and experiences of SMS reminders, and (3) understandings and experiences of real-time adherence monitoring. Social supporter interviews explored the following topics: (1) selection of social supporter by the study participant, (2) type of social support given, and (3) likes and dislikes of the SMS notification. All questions in the interview guide were translated into the local language (Runyankole) and back translated to English by a different translator. Interviews were conducted in the local language, digitally recorded, and translated to English during transcription for analysis. Following each interview, the research investigators reviewed transcripts for quality, clarity, and detail. Quantitative effects of the intervention on adherence, qualitative interpretation of the mechanisms for intervention effects, and exploration of the social supporter aspect of the intervention are reported elsewhere [17,22,24]. Feasibility data were obtained by recording the number of adherence monitors reported or detected to malfunction, percentage of functional adherence monitors at the end of the study, number of battery failures or changes, percentage of data lost because of technical issues, and number of SMSs not sent as planned. Some qualitative aspects of feasibility were also explored, including sources for storing ART other than the monitor, use of the monitor to store other medications, and monitor openings for reasons other than pill-taking. The unified theory of acceptance and use of technology (UTAUT) model, which has been shown to predict a substantial portion of the acceptance of health information technology, served as the conceptual framework for this analysis . In this model, technology adoption is influenced by four major constructs as perceived by an individual user: (1) performance expectancy or perceived usefulness, (2) effort expectancy or percieved ease of use, (3) social norms (ie, how others perceive the individual’s use of the intervention), and (4) facilitating conditions (ie, the availability of technical and organizational infrastructure to support use of the intervention). We used an inductive, content analytic approach to analyze the qualitative data . For this paper, we used the qualitative data management computer software program NVIVO 10 (QSR International., Melbourne, Australia) to organize the data. With substantial input from JEH, NCW, TW, and MAW, AM reviewed transcripts for content relevant to acceptability drawing from the UTAUT model; developed a coding scheme based on the content identified; coded the data; sorted and reviewed the coded data to develop descriptive categories; and mapped the descriptive categories onto the domains of the UTAUT model (focusing on perceived usefulness, perceived ease of use, social norms, and facilitating conditions). Illustrative citations were then selected from the coded data. Quantitative data about the feasibility of the intervention were recorded and summarized descriptively using STATA 13 (StataCorp., College Station, Texas, USA). Of 195 screened individuals, 63 were enrolled in the study from September 2013 to October 2014, whose 9-month follow-up ended in June 2015. One participant was later discovered to be HIV negative and was excluded from the analysis. The criteria for excluding the rest is indicated in Textbox 3 (participants could have >1 criterion). Table 1 indicates the participants’ characteristics. We had 63 participants initially; scheduled SMS arm (21 participants), triggered SMS arm (21 participants), and control arm (21 participants). One participant was found to be HIV negative after randomization and disenrolled from the triggered arm. Four study participants were lost to follow-up (2 in the triggered SMS arm, 2 in the control). A total of 41 social supporters completed the study. One social supporter died, one was lost to follow-up, and two were disenrolled per the study participants’ requests. Textbox 3. Exclusion criteria for study participants. Figure 2. Organization of qualitative data on acceptability following the unified theory of acceptance and use of technology (UTAUT) model. SMS: short message service. Interviews were carried out as follows: (1) semistructured interviews were conducted after month 3 with 41 study participants of the scheduled SMS arm participants (21 participants) and the triggered SMS arm (20 participants) just before completing the first intervention, before switching to the second type of intervention (known as interview 1); (2) semistructured interviews were conducted after the first 48-hour lapse with 30 study participants drawn from the 41 participants of the scheduled SMS and triggered SMS arms (known as interview 2); (3) semistructured interviews were conducted at study exit with 30 participants if there was no lapse (also known as interview 2)—these included 11 participants from scheduled SMS arm and triggered SMS arm that never lapsed and 19 participants from the “control” arm; and (4) semistructured interviews were carried out with 10 social supporters. Acceptability results are presented following the UTAUT model (Figure 2) and detail the performance expectations, effort expectancy, social norms, and facilitating conditions associated with the three components of the intervention: the real-time adherence monitor, participants’ SMS reminders, and SMS notifications for social supporters. I know that every time I open it [device], that light that flashes by its side indicated that a message has been sent to you people telling you that I have opened and taken my pills. I feel it with in my heart not to disappoint you people so I try to open it on time, whenever I can. It [device] reminds me and keeps well my pills I make sure I open it to take my pills because I don’t want you to catch me...I mean I don’t want you people to know that I don’t take my pills and I get problems with you. Participants found the SMS reminders useful in helping them to take their medications on time. SMS reminders addressed forgetfulness to take medications as prescribed, which was a commonly reported problem among study participants who had busy schedules. It was actually in November I had totally forgotten and was on my bed about to fall asleep and I received an SMS on my phone and I got out of bed quickly looked for water and swallowed. I also like it [SMS notification] because when I have many people reminding me it gives great strength. My sister calls me when she receives an SMS reminder and asks why I didn’t swallow. I like the fact that they [SMS notifications] remind us to remind her about her medications. Because I know that by the time I get this message, she has not opened that bottle and I need to find out why and address it. It’s her character that she naturally dreads taking medications and having these reminders and someone to remind her is very important and a very good thought from your end...I know it has helped a lot especially knowing that someone else will be told if she doesn’t take her medications on time...She doesn’t want to disappoint us even after we have united to help her in any possible way. The only problem was that he finished his pills and did not have transport back...I could have sent him transport but that time I was so broke, the landlord was on my case, I did not have even enough food in the house. The only complaint I have about this device is its inability to show its battery charging levels. I cannot tell whether the battery is full or empty. I thought the SMS reminder would be in English so I wouldn’t understand them but they came in my local language so I felt happy and I can’t forget this SMS reminder. There are times when she asks for some support but I fail to help her...Like in giving her good food. When a person is sick, they need to feed well. There are also some tasks that are tiring like fetching water as we get it from far. I know she would want to get the water brought closer to her but I sometimes cannot help her. I would need to fetch the water for her or get her someone to help her fetch the water but it is expensive to pay for this. So there are such things that you know she needs help with but I am not able to help. Study participants stated that use of the monitoring device influenced disclosure of their HIV status to the community. For some, the adherence monitor assisted with disclosure that would potentially generate social support to help them cope with having HIV. They saw it blinking and asked me what it was...I told them it is a bottle where I keep my medicine. And when they asked about which medicine, I told them that I was HIV positive...I thought it was not wise for me to hide my HIV status from my relatives since they had seen my bottle and had also seen me taking the medicine. I might get sick and ask them to help me get the medicine from the bottle. When they do not know the use of the bottle, they will say that we asked you what the bottle was for and you ignored us so why are you bothering us now. I had gone to the village and hadn’t gone with it [device] because I didn’t want people in my village to see it. Thieves broke in my house and stole everything including the device. Later my things were retrieved and people opened it and saw that there were pills for ART so they got surprised and got to know that I was positiveI got ashamed and got it [device] from them but of course some keep talking about me and some felt sorry for me but I just left them had nothing to do for them. I decided on a message [“wasiboota” or how was your day] that would not easily connect me to the clinic and my HIV status. Even when you are with people and this message comes, you do not even try to hide the message because someone who sees the message will straight away know someone who cares about you is just greeting you. But if you received a message reminder like “mira emibaazi yawe” (meaning take your medicines), someone might ask you which medicines you are going to take and there, they might know that you are sick or start asking you all sorts of questions. I choose my husband because other people normally talk about other peoples’ HIV status if they get to know it...If you send the messages to my husband, he reads them and tells me. But other people might start telling the whole village how I am sick and I do not like it. That is why I chose only my husband because he keeps my HIV status a secret. The network was always ok. There is network here so I haven’t found any challenge with it. There is when you brought me an electric charger I was so happy because I stay in very busy place so charging using solar would have caused them to suspect something or even steal the solar panel. So I thank you for that. He [my husband] has been with the phone like for 2 weeks. So I have not seen the messages that have been sent to my phone during the time my husband had the phone. Yes [I received the SMS reminder] once. Just one message. That was before I lost my phone. Data transmission generally worked well with 89% of data transmitted after a delay of 0 to 5 min. Nine percent of the device-opening data was transmitted after device signal delays of ≥60 min (because of unreliable network), which resulted in unnecessary transmission of SMS reminders. Other feasibility issues are summarized in Table 2. Device malfunction 3 (2%) out of 63 devices malfunctioned and were replaced: one of the devices was damaged by the participant, while the remaining had technical faults. Data loss 191.6 (3%, 191.6/8365) of data were lost because of technical issues with the adherence monitors. Device battery changes Although all study participants had a solar charger and 13 had electric chargers, study staff completed 22 battery changes because of (1) poor mobile network that resulted in repeated attempts to transmit the data, which depleted the battery before its anticipated charging time; and/or (2) inability or failure of the participants to charge the batteries as requested. Lost to follow-up One participant was lost to follow-up because of a nonfunctioning phone number. Number of messages sent unnecessarily 1935 (36%) SMS reminders were sent unnecessarily. In these cases, the electronic adherence monitor was opened to take medication, but poor mobile network coverage resulted in a delay or absence of the signals. Table 2. Technical feasibility of the electronic adherence monitor. 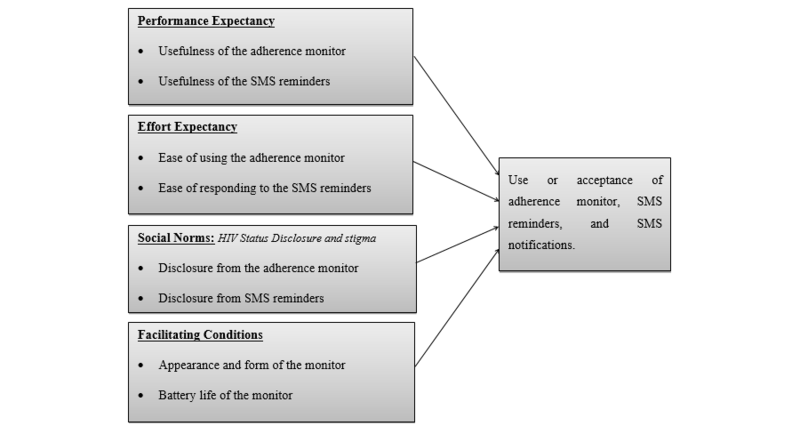 Drawing from the UTAUT model, we found that a real-time adherence monitoring intervention linked to SMS reminders and notifications is largely acceptable and feasible for supporting ART medication in rural southwestern Uganda. Overall, the key factor for acceptability appeared to be perceived usefulness; although the electronic adherence monitor was only initially intended to monitor adherence, it was also beneficial in creating a sense of being “cared for” and a sense of fear of “being caught” not adhering, both of which inspired participants to take medications to maintain their ongoing relationships with the study staff. SMS text messages not only reminded patients to take medication in time but also enabled social supporters to provide medication-taking-related support. Reminding participants to take medication was important given that participants were newly initiating ART and were likely unfamiliar with the required regularities of taking this medication. Reminders significantly improved study participants’ medication adherence , which helped some develop a habit of medication adherence . SMS text messages have previously been reported to be acceptable among youth living with HIV in central Uganda , although this acceptability did not translate into improved medication adherence . SMS notifications to social supporters were also perceived as useful; for example, they triggered social support and improved relationships between social supporters and patients. However, many did not result in participants getting medication-taking assistance. As reported previously, social supporters who were in good relationships with study participants, had enough resources, and lived with or near study participants were more helpful . Training social supporters about the importance of medication adherence, as well as orienting them on how to assist participants with taking their medications, may improve the acceptability and feasibility of social support notifications. Although acceptability was largely high, concerns about possibilities of HIV status disclosure and stigma or discrimination led to nonuse of the monitor by some participants who opted to take medication from different sources other than the monitor. Concerns of monitor-related unwanted disclosure have been previously reported in China , whereas HIV status disclosure resulting from other people accessing SMS reminders have been reported by youth in Uganda . Privacy and confidentiality remain key issues that can affect the acceptability of electronic adherence monitors . In Uganda, this is accelarated by the prevailing stigma, discrimination, negative attitudes, and mistreatment of PLWHA . HIV-related stigma is known to negatively impact medication adherence as it can limit social support and coping strategies . Measures undertaken by our study to reduce the possibility of unintended HIV status disclosure included using SMS reminder text messages that could not easily be linked to HIV, emphasizing personal phone ownership rather than shared phones, and suggesting that study participants select social supporters who they trust and who already knew the participant’s HIV status. It is worth noting that intervention-facilitated disclosure was not entirely negative. For example, some participants who had challenges disclosing their status used the adherence monitor to disclose their HIV status to their potential social supporters. Our results generally indicate that the intervention is technically feasible in Uganda as malfunctioning was rare. Data were obtained from most participants as expected most of the time. The fact that all participants per enrollment criteria owned personal phones, had the ability to read SMS text message reminders, and had reliable mobile network may have been contributory. The widespread adoption of cell phones and the adequate mobile network in most parts of Uganda  facilitates feasibility of mHealth interventions. By leveraging the existing mobile phone infrastructure, this intervention can potentially overcome some of the barriers to medication adherence, while at the same time empowering patients to take active roles in their own health. However, variations among different populations may influence feasibility. In a survey of phone ownership in Africa, 93% of Ugandans with at least a secondary education own a cell phone, compared with 61% of those with less education . In our study, 63% (123/195) of the potential participants screened had personal cell phones with adequate mobile networks, while 97% (61/63) could read English or the local language (Runyankole). Wider implementation of this intervention in less educated or resourced populations may yield differing feasibility results. Despite the general feasibility of the intervention, challenges with access to electricity, lack of technical function when the devices are not charged, inability to charge the monitor, and the monitor’s inability to show battery level could limit the impact of the intervention. The reported use of the solar panel to provide light for the family instead of charging the monitor shows the complexity of introducing electronic monitors in resource-limited settings. In Uganda, many people in rural areas still lack access to electricity . Other challenges included shared phone ownership, as well as the potential for disclosure or theft with the solar chargers that had to be charged from outside the house. Providing more training on charging the monitor, incorporating a component of showing battery levels on the monitor, and use of solar chargers could help users promptly comply with its charging demands. Although reported by a minority of participants, monitor openings because of curiosity and use of the device for other medications could result in misclassification of adherence. Some of this bias can be reduced in analyzing the adherence data (eg, censoring more openings than would be expected per day). Additionally, complementing adherence monitoring with assessment of biological indicators (such as viral loads), as done in this study , can improve the interpretation of adherence reports generated by using the monitor. This analysis has a number of strengths. First, it is grounded in a well-established theory of technology acceptance—the UTAUT model. Second, it is an in-depth qualitative investigation of the experiences of study participants and their social supporters based on the state-of-art adherence measurement technology. Third, the study was conducted in a prototypical rural African setting, which has implications for similar settings, although cultural differences may have an impact on acceptability. However, results may have limited generalizability as they are based on a small pilot study of 63 participants over 9 months of follow-up. It is not clear how they manifest in larger, diverse contexts, with long-term follow-up. Importantly, HIV requires lifelong treatment. A number of important implications for further use and development of this type of intervention arise from this study. First, the possibility of dependence on the intervention and its potential consequences on adherence after the withdrawal of the intervention warrants further investigation. We are currently carrying out a follow-up study to explore how these participants feel about the lack of the intervention and how they adhere to their ART after withdrawing the intervention. Second, concerns of unwanted HIV status disclosure could potentially be further minimized by extending the use of the monitor in other diseases (especially nonstigmatized conditions such as hypertension), so that it is not associated with HIV. Other means for protecting against disclosure include using password-protected phones and training social supporters about the need to maintain patients’ privacy. Additionally, although costing was not addressed in this study, it is clearly important, especially in resource-limited settings. Each real-time adherence monitor costs about US $130, which is expensive for most low-resource countries. This cost may be reduced if the adherence monitors are developed and maintained by local capacity and produced in large quantities. A recent cost-effectiveness analysis indicated that this type of monitoring would be cost-effective at <US $50, thus marking a target for device development . In conclusion, we found that real-time adherence monitoring, SMS text message reminders, and notifications to support ART medication adherence were largely acceptable based primarily on perceived utility and feasible in a research context within a low-resourced setting. Future efforts should focus on optimized device design, user training to overcome the challenges we encountered, cost-effectiveness studies, as well as studying the monitoring aspect of the device without accompanying interventions. The authors would like to acknowledge the contributions of Justus Ashaba, Judith Namanya, Moonlight Sheila, Moran Owembabazi, as well as those of Wisepill Technologies, Dimagi, and Yo! Voice Solutions. The authors have no financial relationships with any of the technological partners in this study. The study was funded by a grant from the US National Institutes of Health (R34MH100940). AM is also supported by Fogarty International Center of the National Institutes of Health (K43TW010388). The study was registered with ClinicalTrials.gov (NCT01957865). The content of this paper is solely the responsibility of the authors and does not necessarily represent the official views of the National Institutes of Health. ©Angella Musiimenta, Esther C Atukunda, Wilson Tumuhimbise, Emily E Pisarski, Melanie Tam, Monique A Wyatt, Norma C Ware, Jessica E Haberer. Originally published in JMIR Mhealth and Uhealth (http://mhealth.jmir.org), 17.05.2018.